TOPOutgoing Miss Northern Navajo Megan Bedonie places the new crown on top of the 2014-2015 Miss Northern Navajo Robyn Barber’s head as Navajo Nation President Ben Shelly and his First Lady Martha Shelly look on. It’s the beginning of an era because the newly crowned Miss Northern Navajo, Robyn Barber, is the first royalty to wear the new crown. 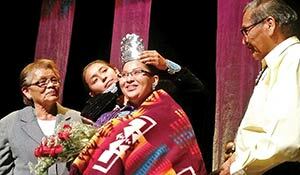 Barber, 19, from Littlewater, N.M., was crowned the 2014-15 Miss Northern Navajo after a weeklong pageant during the Northern Navajo Fair last week. 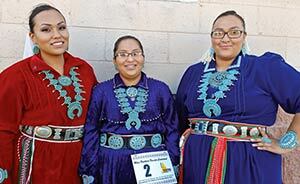 Barber also won best frybread and interview. Out of the three contestants vying for the new crown Barber won over the judges at the end of the week. “It is shocking,” Barber said of her crowning, noting that she is still trying to adjust to it.